The Adventure Starts Here: So Many Toys! Toys... if you have kids, you are bound to have toys. And while you may have a minimalist philosophy, you are still bound to have enough that you will need to figure out a storage system. 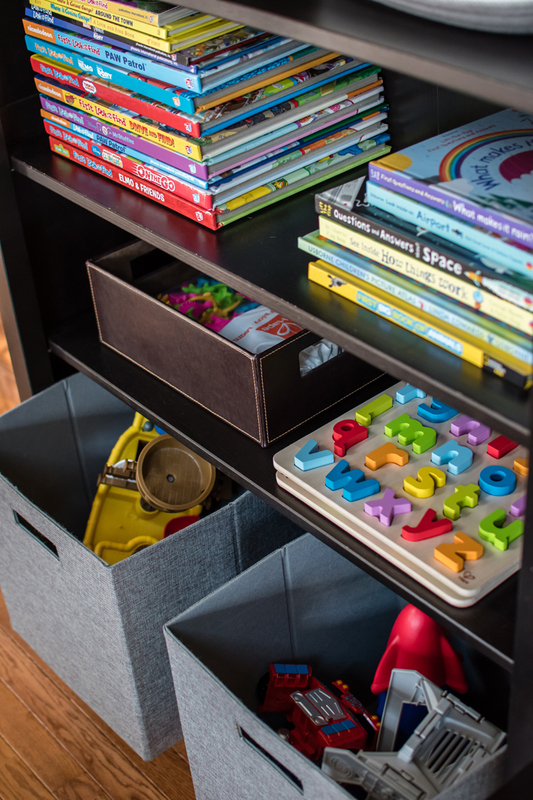 While we definitely don't have a minimalist approach when it comes to toys, we did try to pare down this month after Noah got a lot of birthday and Christmas gifts. 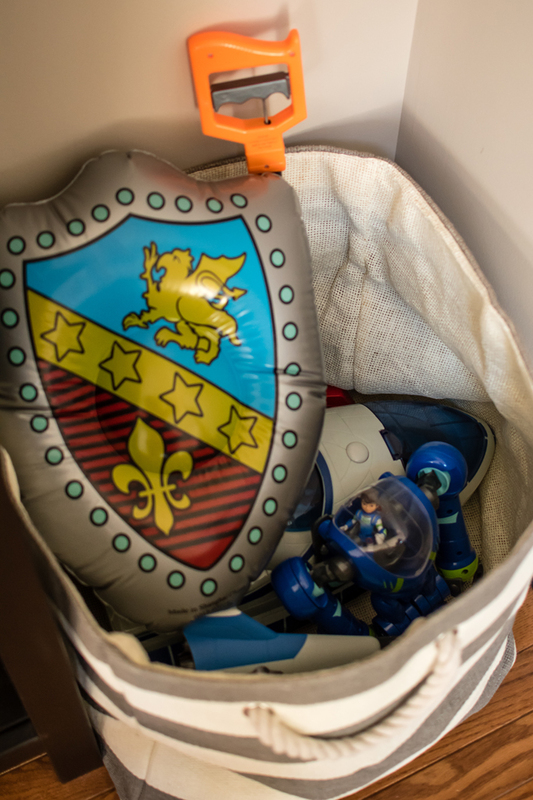 Before I share how we store all our toys, I'll give you a little background. We live in a pretty average size house. Not large by any means, but I would never describe it as small either. We have one eating area (not a dining room and eat in kitchen) and we only have one living area (no additional family or play room on our main level). We are however lucky enough to have a full basement, most of which is finished. Noah is an only child and chances are will remain that way. 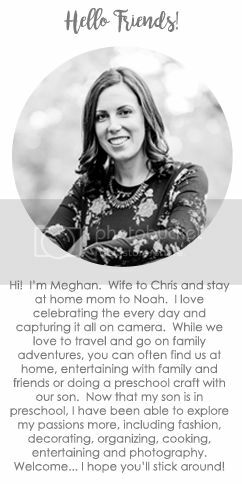 I am a stay at home mom, and while Noah does go to preschool 3 mornings a week and has a few other activities throughout the week, we spend a lot of time at home (especially in the winter months). And as most 4 year olds, he likes to play. As much as I would love to only let him have wooden toys that are more appealing to the eye, I also want to make sure that Noah has toys that he actually likes. And at the moment, that includes a lot of superheroes and trucks, all of which are plastic. Noah is one of those kids who actually plays with his toys, so I don't mind having a lot of them. There are times where certain toys don't get touched as often, but then one day he will randomly pull it out and play with it nonstop. I contemplated rotating toys, but I've learned that Noah is somewhat spontaneous with what toys he wants to play with on a certain day and often likes to mix "characters". I love seeing the superheroes help out the Octonauts and the rocket ship go on adventures with his pirate ship. If I set up a toy rotation, I doubt this organic play time would happen. Instead, I try be thoughtful in the toys I keep on our main level versus the ones we keep in the basement "play room". In theory, I could make it that toys are only kept in our basement, but in all honesty, that would make my daily life harder. During the week, I'm often doing laundry, cleaning, or preparing meals in the kitchen while Noah is playing. I prefer that he plays nearby and on the same level as I am. If all his toys were in the basement, I would feel very limited in what I could get done each day. Instead, the basement is where he and his daddy often play on the weekends. They create elaborate scenes with blocks, construction trucks, and the Paw Patrol. And since it's downstairs, they are able to leave up their creations to continue playing with the next day. 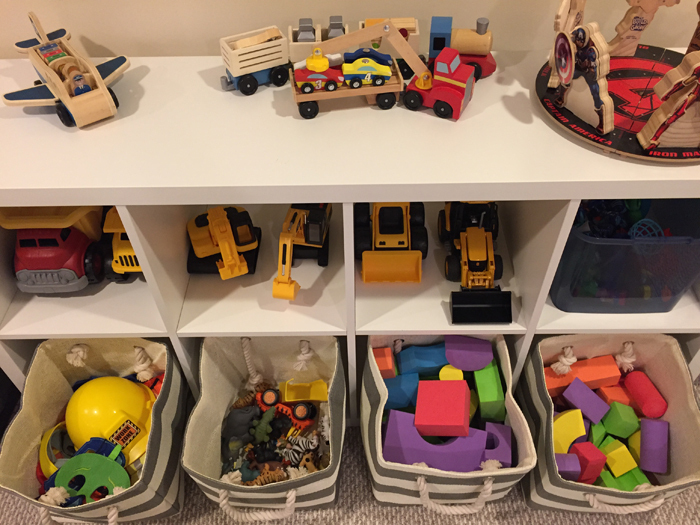 While upstairs, I like to have a few of his more recent favorite toys as well as quiet activities like puzzles, Magnatiles, and Legos. So in a way, we are rotating toys. He plays with his upstair toys during the week and his basement toys on the weekend. And this way, he is very excited to play with each of them after not seeing them for a little while. So far our system is working out well. So now for the details... and lots of photos! First up, is our living room. 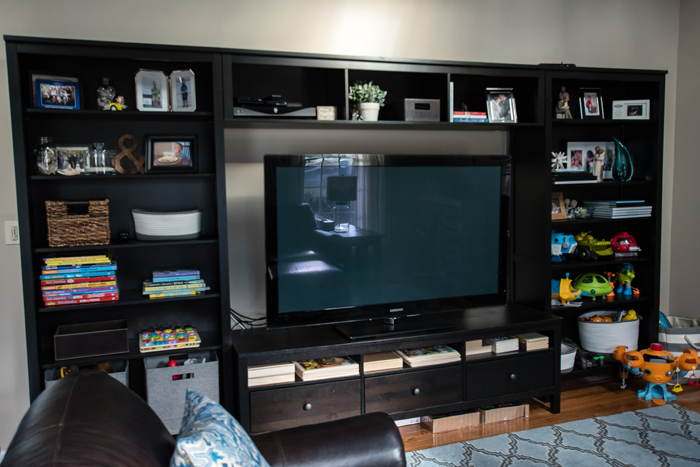 Our main form of storage is this large Hemnes entertainment center (base, shelves, bridge) from Ikea. While I would have preferred it in white, I do have to take Chris' opinion into consideration, and he really preferred the brown/black. 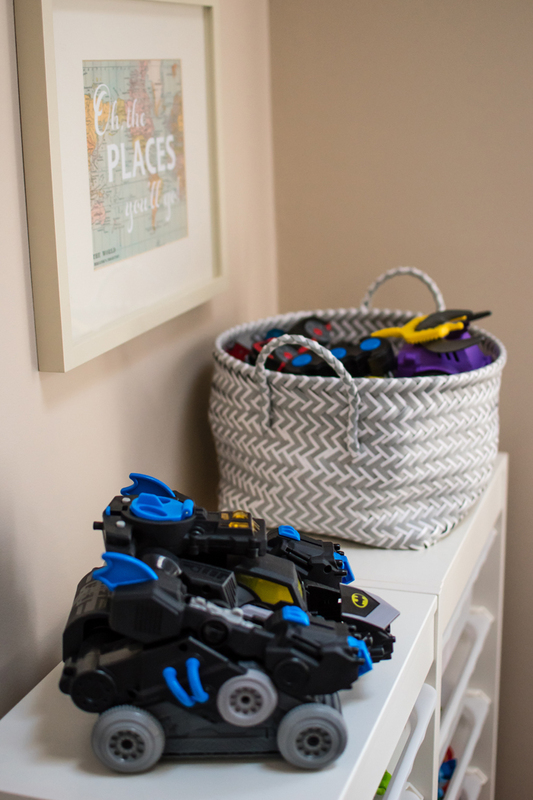 I am constantly changing up how I store and display things as Noah's toys are updated. 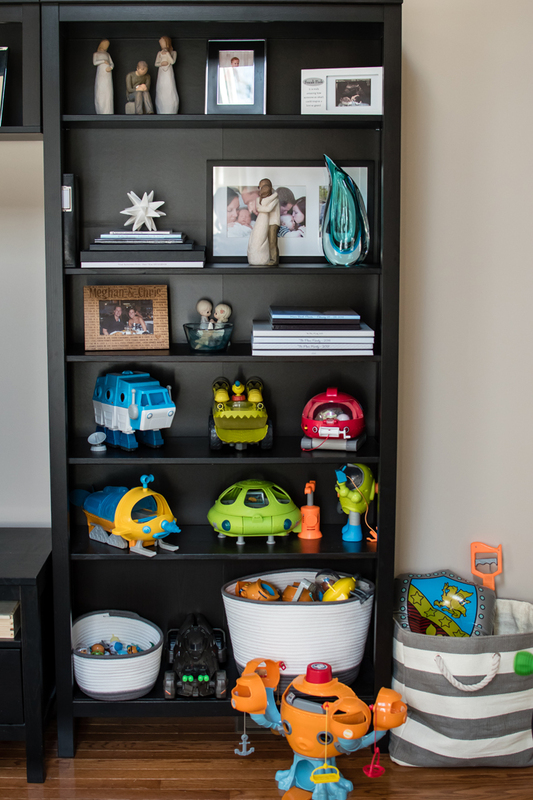 The only thing that has stayed the same, is that Noah gets the bottom 3 shelves and drawers for toys and I get the top shelves to style and decorate how I choose. 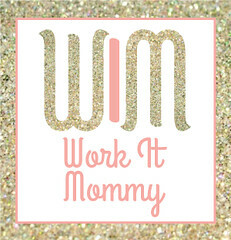 While I would love to have the entire unit to make Pinterest pretty, that's just not the stage we are currently in. We are a very kid oriented family and really like that our living room is for our entire family. Here's a close up of the left side of the entertainment unit. I tried to label as much as I could, so the photos should be pretty self explanatory. We have some photos and beach souvenirs on top. I also like having my DSLR handy so that I can grab it easily, but still like that it's concealed. 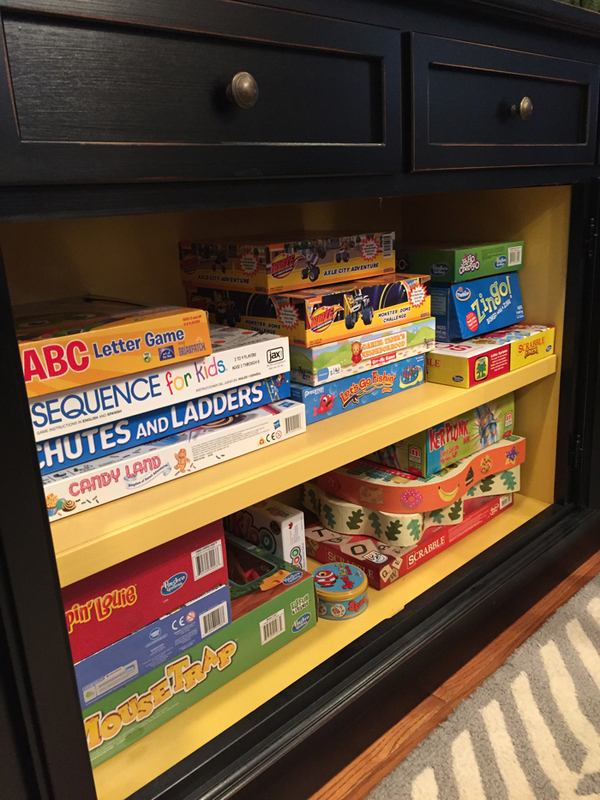 As for Noah's things, we have books, some alphabet puzzles, quiet games, and a few larger toys in the bins. When we first moved in, we had a lot of larger trucks on display in the shelves. 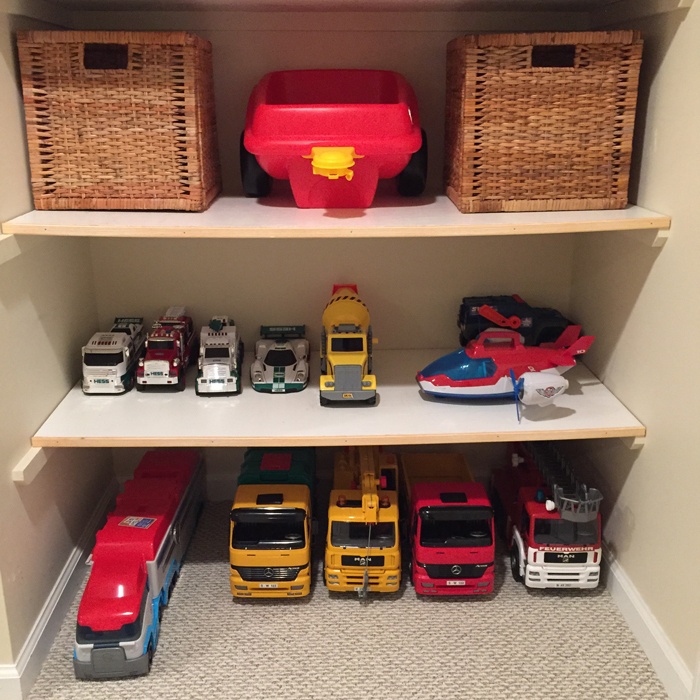 For the most part now, he prefers the smaller vehicles and figurines that are easily stored in baskets. 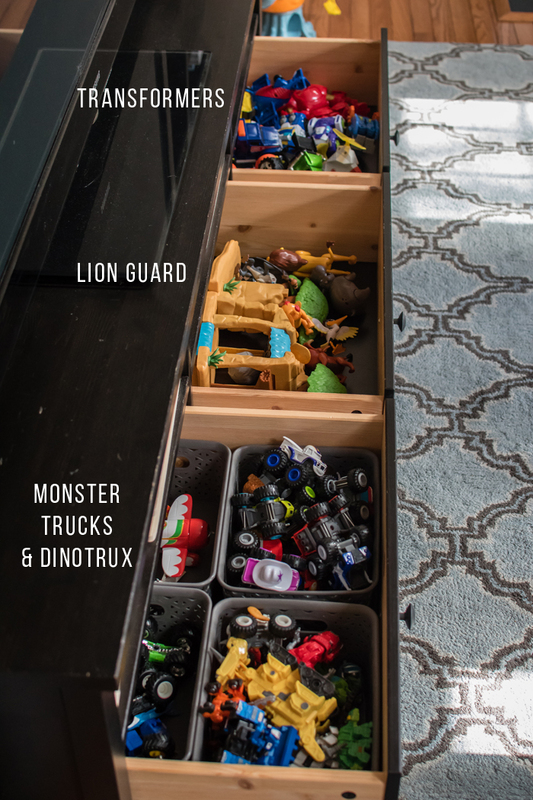 I like filling these drawers with his Transformers and monster trucks. It's an easy way to have Noah help clean up since he can just throw everything in to the appropriate drawer at the end of the day. And he knows where to look when ever he's looking for a particular truck. 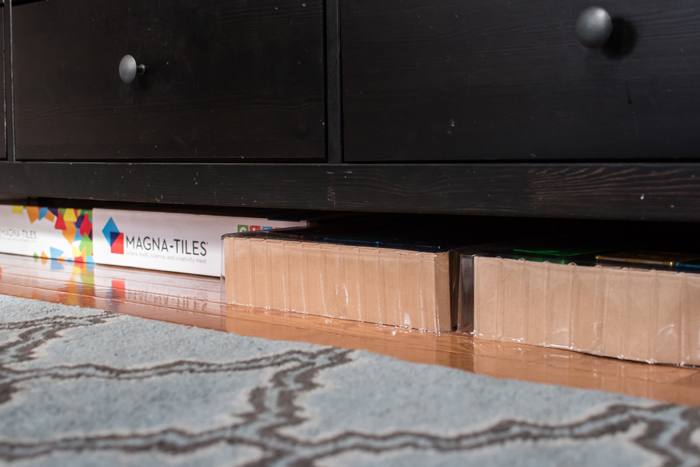 I slid the Magnatiles boxes under the drawers. I really like the separation the original Magnatiles boxes provide, so I decided to just leave them as is. It might not be the prettiest, but it is super functional. 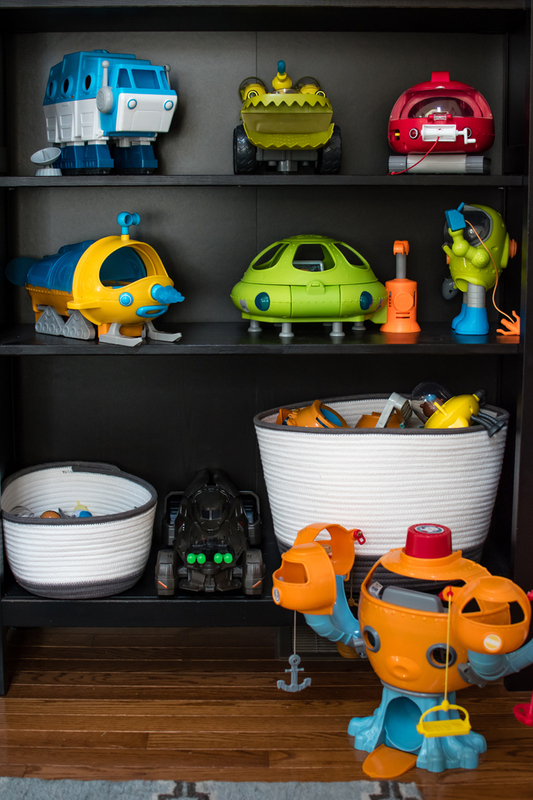 The right bookcase is filled with photo albums, Willow Tree figurines, and all things Octonauts! Noah's Octonauts Gups are the most difficult for me to organize. While I don't love the look, I've found that the easiest way is to "display" them on the shelves. It's easier for him to pick which Gup he wants and I find he plays with them a lot more than when they are just thrown in a large basket. So while I would love it if they were more hidden, I'm learning to accept it. While the Gups are out on display, I do use a large basket to corral some of Noah's larger and more random toys. Like his Miles spaceships and his claw and shield that he uses on a daily basis. In the last year, we added this Trofast unit. 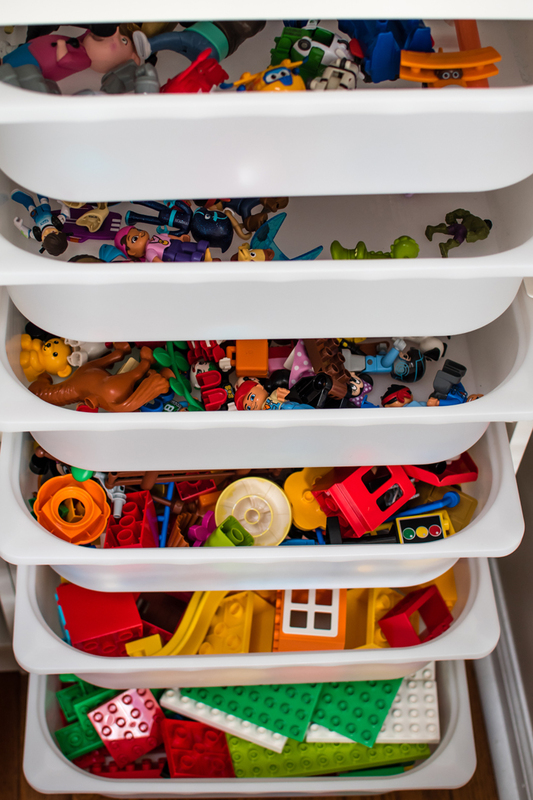 Originally it was just for Noah's Duplos, but since then we've used it to store some of Noah's small figurines as well. Noah has graduated to building with Lego Juniors, but he still likes coming up with his own creations using the Duplos. So while I've pared down his collection, he still has plenty to build with! On top, I corralled all of his superhero and Ninja Turtle vehicles in a basket. 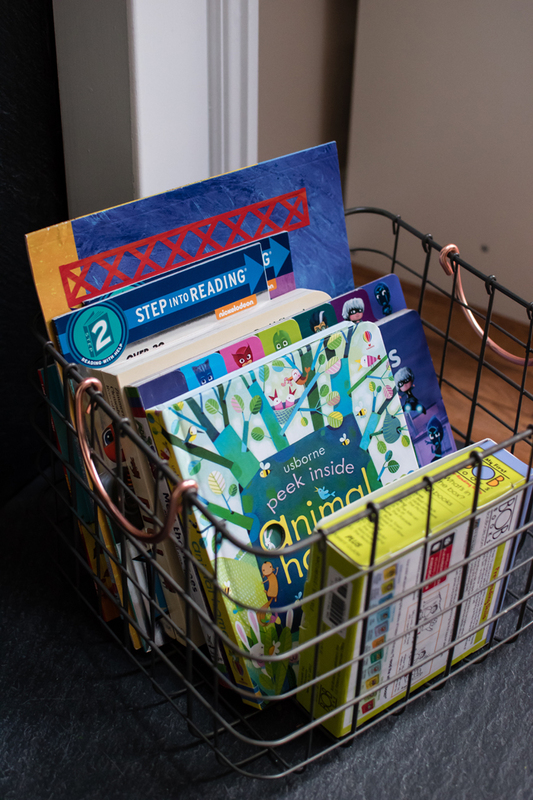 And while most of Noah's books are stored in his bedroom, I just recently added a wire basket filled with a few of our current favorites. It's perfect for some afternoon reading. 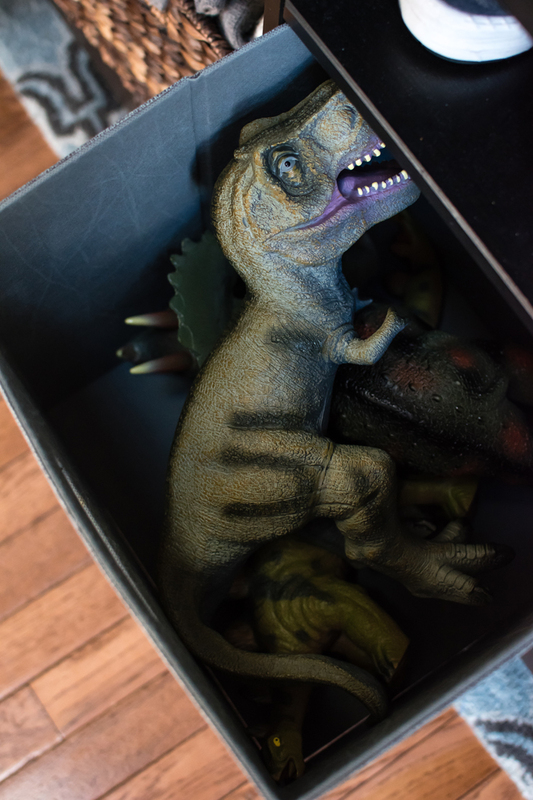 And finally, we have a few last toys stored in the sofa table... like his dinosaurs! Moving onto our dining room area. This is where we have Noah's toy kitchen. I find that Noah loves to play in it when I'm cooking and he loves bringing Chris and me toy food when we are eating our real dinner. This is also one of our most popular toys for when friends come over. No matter the age or gender, everyone loves playing in the kitchen. That's why I love having it out in our dining area since that's where we spend most of our time when entertaining. But my favorite part of Noah's kitchen is the "Only Pizza" sign he made a while back. I just love it so much that I never plan to take it down! 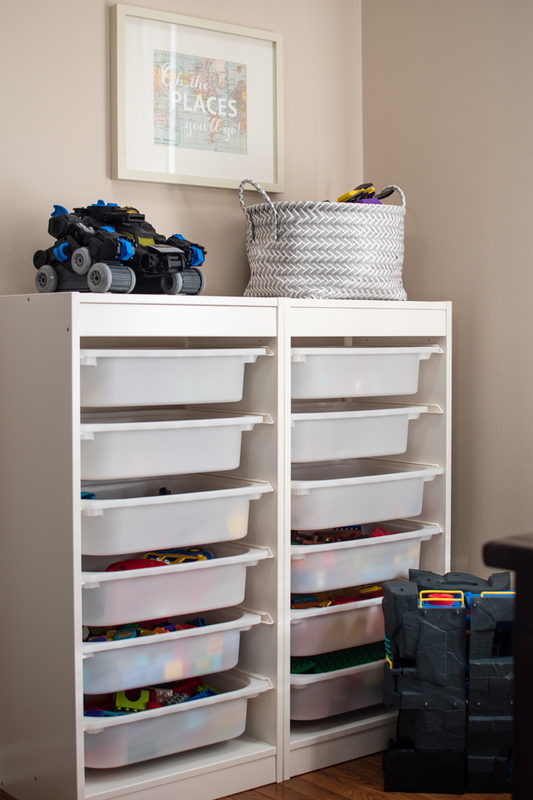 We have one more Kallax in our dining area that now holds all of his Lego Junior boxes. 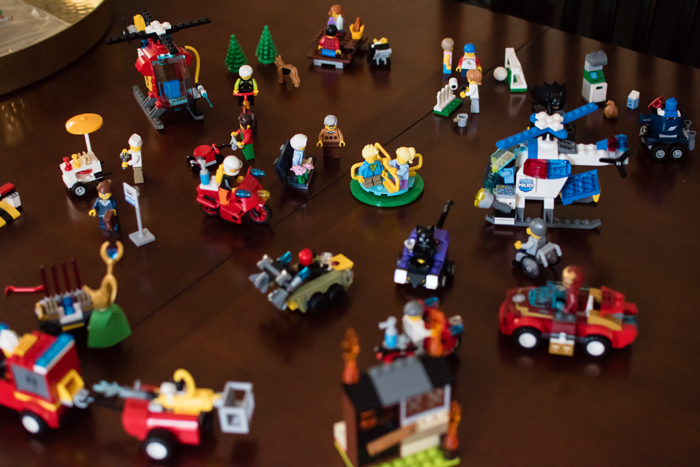 We do most of our Lego building at the dining room table, so it's nice to have our unopened boxes nearby for when we want to build something new. I also keep a basket full of activity books and kid magazines for us to grab when we are going out to dinner. And I know I've shared this before, but recently we moved our China out of our buffet cabinet and store all of our board games and floor puzzles in here instead. I'm really loving how everything is behind closed doors but still easy to access. And I have to share how we store Noah's Matchbox cars. We quickly grew a very large collection of cars. I bought these plastic cases that are actually meant to store sewing thread. The great thing is, they are the perfect size for his cars! Each one stores 48 cars. While I think 48 cars is plenty, Chris and Noah thought otherwise, so we have 2 cases ;) Whenever it's time to race cars, Noah can find the exact car he wants and then easily put them back and out of the way when he's done. And while we have many systems in place, there's still a few works in progress. Like all the Lego Junior creations we've put together. Right now they are taking over half of our dining room table. 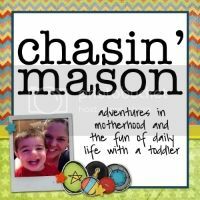 The plan is to hang some shelves in Noah's room so that they can all be stored and displayed in once place. 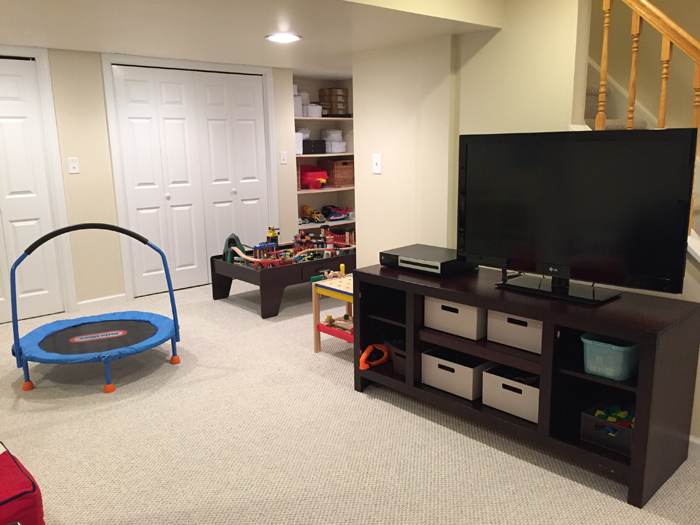 And now for our finished basement. I mentioned that this is where Noah and Chris mostly play. 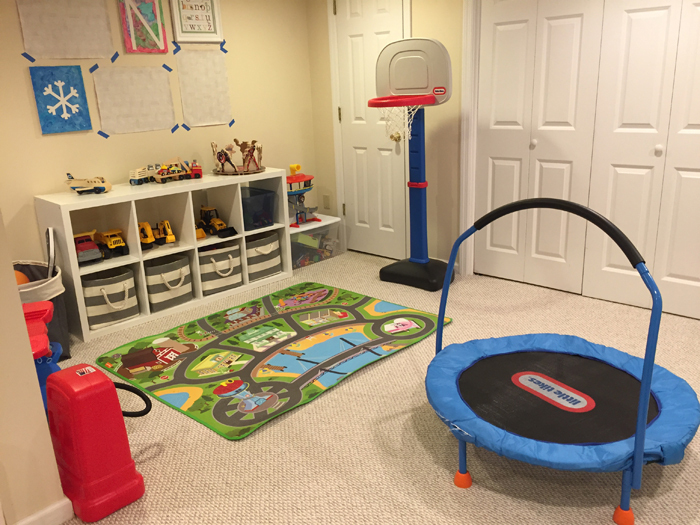 This is where we keep Noah's building blocks, trucks, and his larger toys like his trampoline, train table, and basketball hoop. When Chris is home on the weekends, he actively plays with Noah. They come up with some pretty fun games down there with all his trucks and blocks! The one thing I still need to do is finally finish this gallery wall! It's been like this for almost a year! The craziest part is the printed photos are all in the frames... I just have to hammer the nails in the wall! 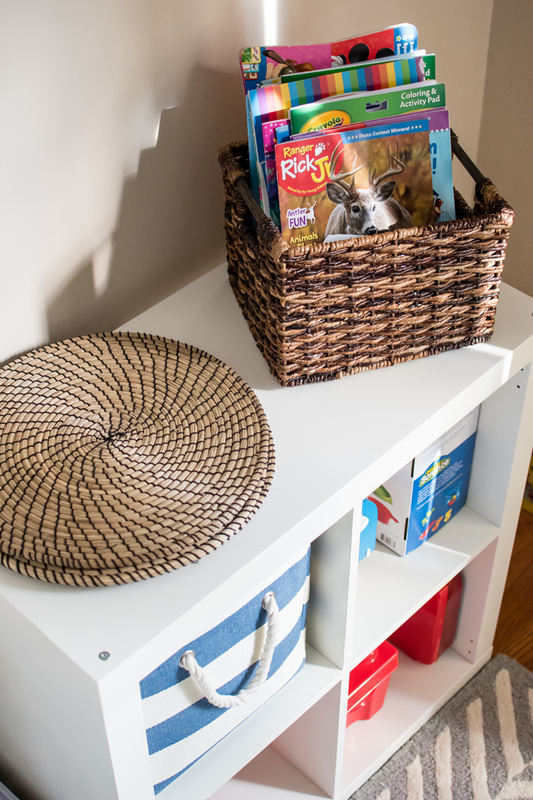 As you can see, we really love the Ikea Kallax and these striped canvas baskets from Land of Nod... we have them all over our house! Congratulations if you made it all the way to the end. I know it was a lot of information (and toys). 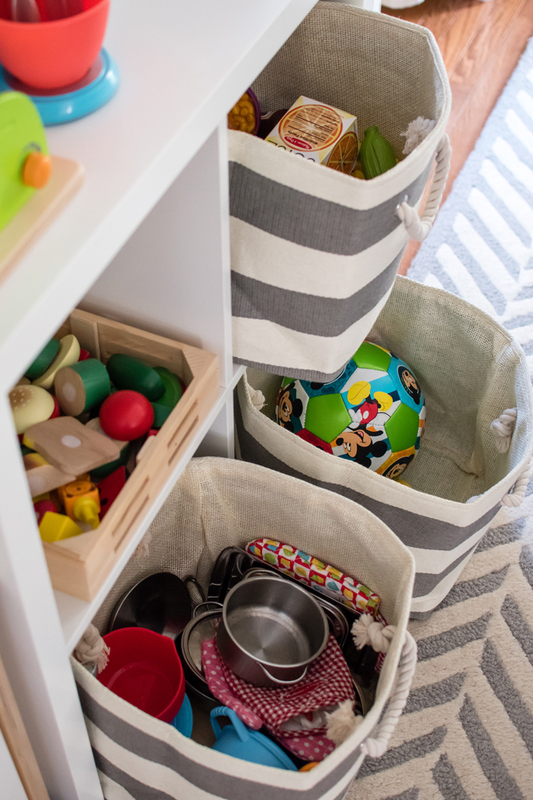 While we have a lot of toys and make lots of messes on a daily basis, I love that we have a system in place to clean it all up at the end of the day or when company is coming over. 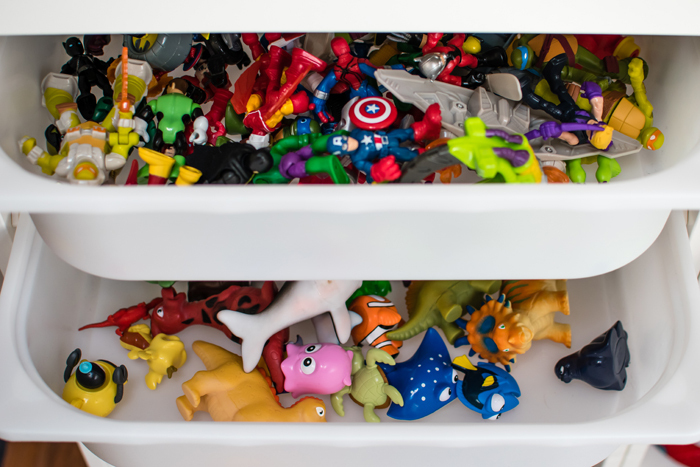 Do you have a lot of toys or do you follow a more minimalist approach? 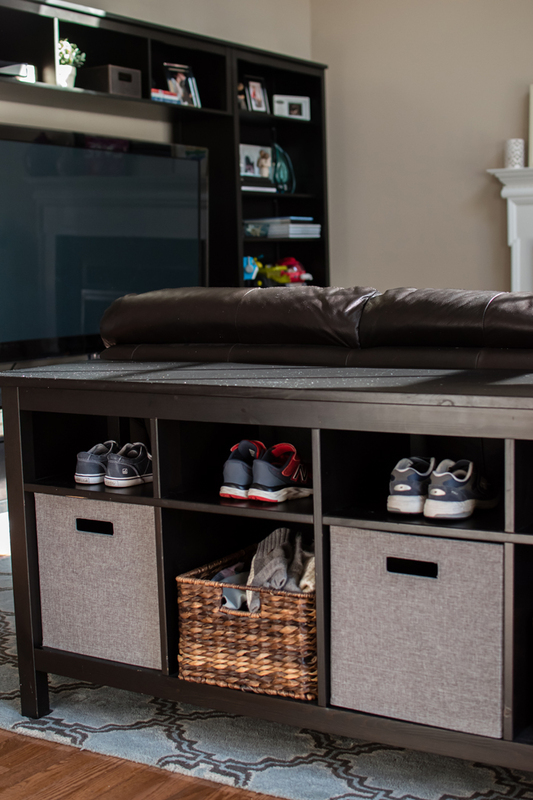 What are your favorite storage systems to manage it all? OMG you were not kidding - SO MANY TOYS! You have us blown out of the water!! First, LOVING the basket for the DSLR - genius!! 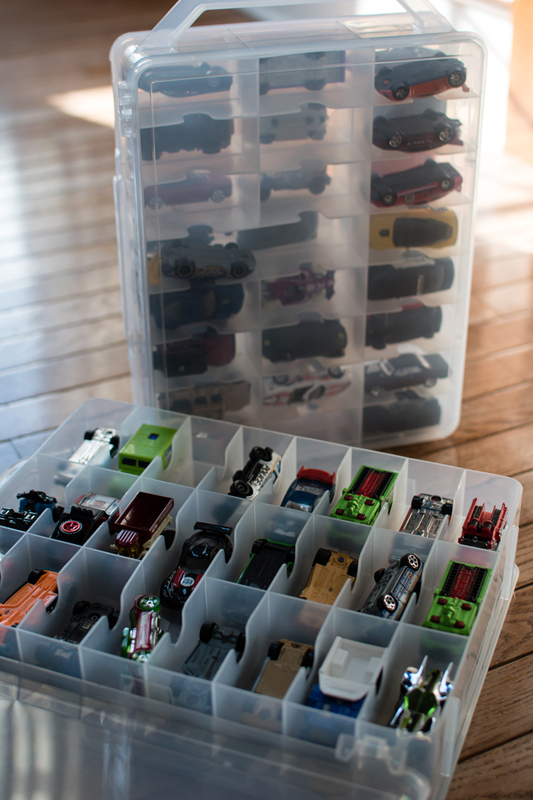 Next, I'm swooning over all your containers (like the one for the matchbox cars). Also - we have one of those same wicker baskets from Target with the chalkboard label. It looks like you wrote on it with regular chalk? Swap for a chalk pen and you won't have to worry about the letters being rubbed off ;) Happy Friday!! With four kids, we have WAY too many toys. It's just hard to get rid of things when I know that they can be passed down to the younger kids. 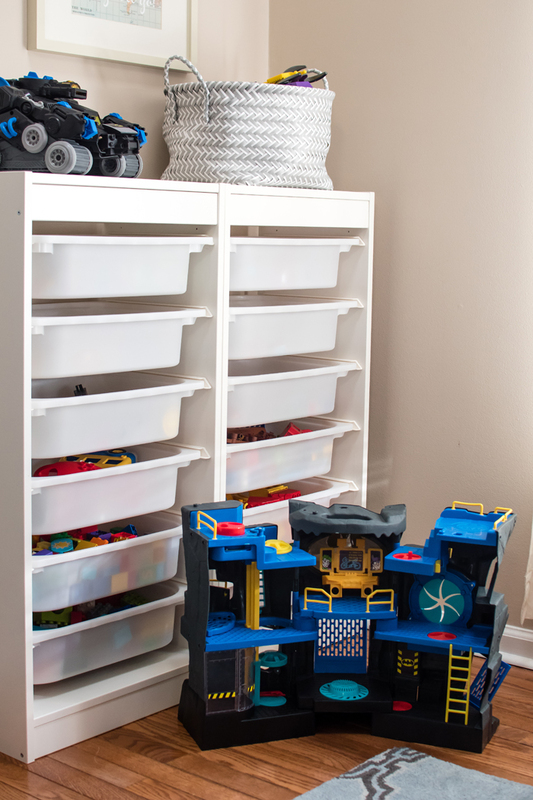 My toddler is a toy bin dumper so I stored those units away until he's a bit older. His toys are the only ones in the living room. 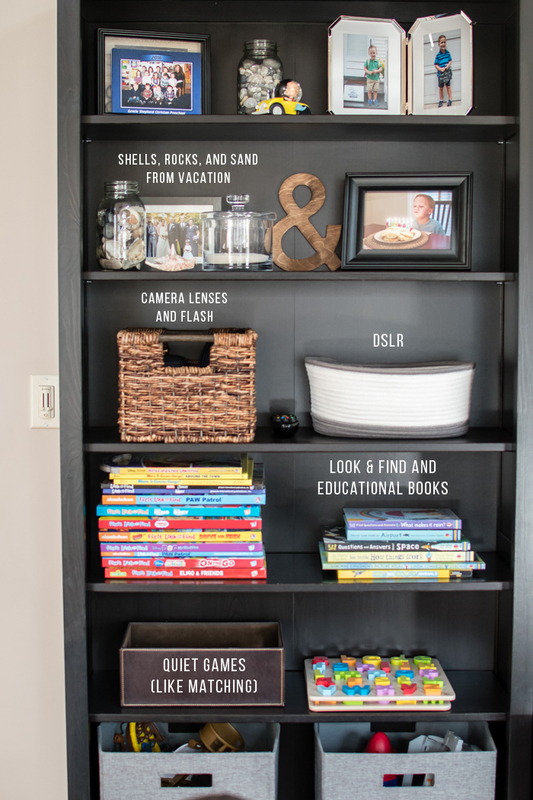 He has a bookcase with all of his books and puzzles on it and I keep 3 storage bins with big toys in there. The rest of the bins are stored in the attic and I rotate the bins each week so he plays with everything. Connor and I are you and Noah. ALLLLL THE TOYYYYSSS! I need to invest in a Trofast for the playroom. It would help organize things a bit and allow Connor to get things as he wants them. Thank you for this! I'm working on toys now...we have them in the living room, office, and basement. Whenever I go into the basement I get overwhelmed! The living room is looking better right now. I just got rid of all our duplos but the legos in the office are insane. Your toy kitchen is so nice! Ours is a big hunk of plastic. We need to get rid of it. We used to keep it in the kitchen too when the kids were little, now it's in the basement! We used to keep the toy cars in a slotted holder like that but they never made it back in there, so now they're just in a bin. I hate how things get lost in the bins though! I also like that all your storage systems are the same so you can move things around when needed. Organizing toys is so hard! We have a bunch of different storage units/methods but I really can't wait until we redo our den and that becomes Sadie's main play area. I want the stuff (mainly) out of my living room! We just took our first family trip to Ikea and I wanted one trofast system. We left with three, but they are so awesome!! Reed never plays with his Octobaut stuff, and they're in a big basket. Wonder if I should swap them out and stick them on a shelf. We used to do toy rotation here, but his toys are so much smaller now it seems that I don't feel like they take up as much space, so they're all out now. It's nice not to have to remember to rotate them! I love that you have an assigned, convenient spot for your camera. Mine usually lives on my desk. You guys are so organized! We have toys all over the house and I try to keep them all in groups like Legos, cars, trains, superheroes, etc. But they dont all have a home, just a box. 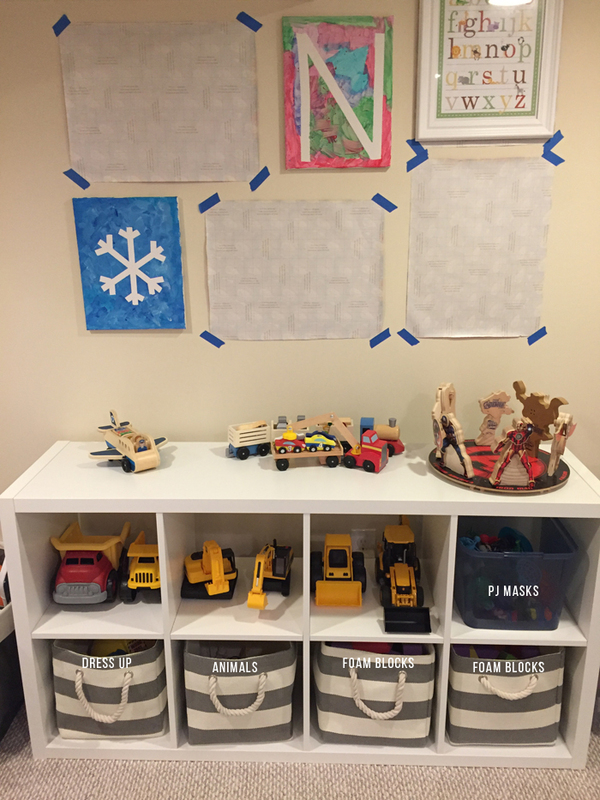 Planning a major organization once we move since we'll have a "toy room" to house it all! You are so organized and I love it! I need some organizational furniture pieces. 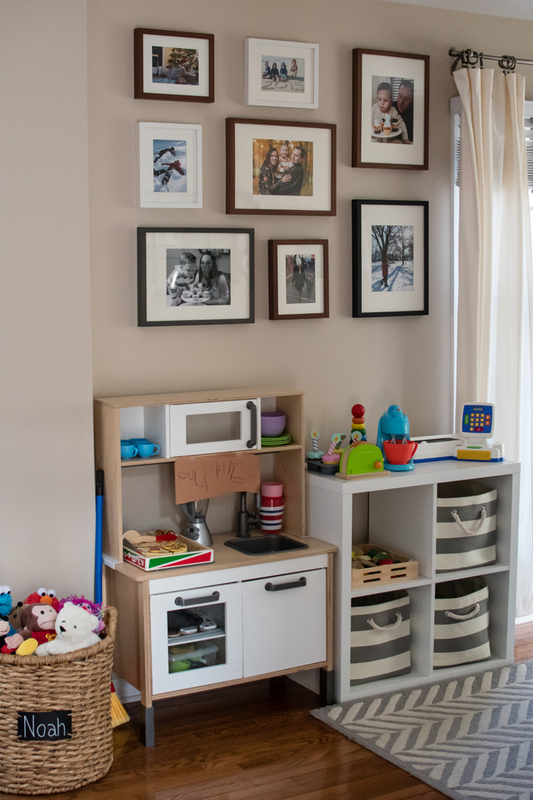 That's one thing we lack in this house - storage space! And oh what I would do to have a finished basement. They are so uncommon here in Texas!